Welcome! It is a new month, which means there is new batch of products on the Artisan Design Team Blog Hops. In fact, these items are so new that not all of us have them. Some of the European and South Pacific Artisans are still waiting for there boxes to come. 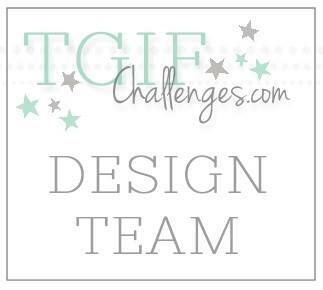 Don't worry though, they still have some amazing projects to share with you using products from past months. So without further wait, let me show you my project which is filled with sneak peeks! The star of this project is the You've Got This Stamp Set. I heat embossed the beautiful flower image and then water-colored it with Watermelon Wonder, Cucumber Crush, and Delightful Dijon (new In Colors!). When water-coloring, you normally stamp the image in StazOn, but an embossed image creates a softer effect. See that pretty lace ribbon? Yup! Another new item! All of the new In Colors will be in this ribbon. 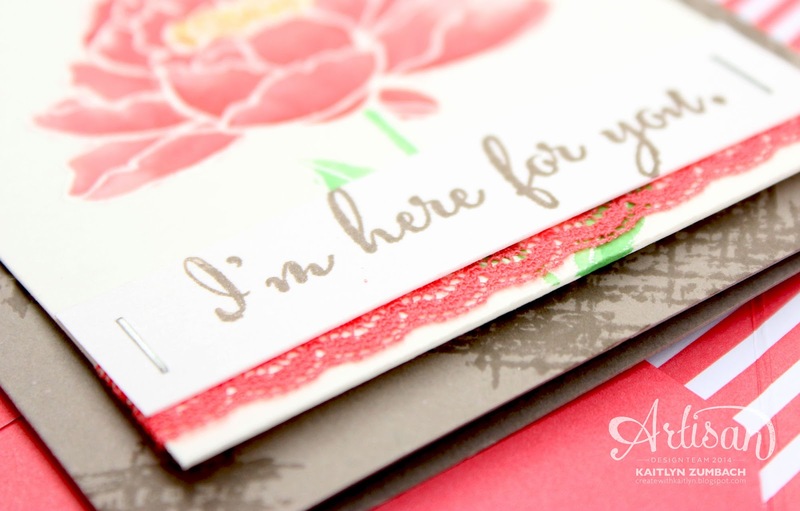 The card bases are another new In Color - Tip Top Taupe. I wasn't crazy about this color at first, but it has quickly become a favorite! Tip Top Taupe is going to be a great neutral for just about any project. I was able to make matching envelopes for these little 3-1/2" x 3-1/2" cards with the new In Color Envelope Paper. This paper is lighter than the Designer Series Paper, and just like the name suggests, it is perfect for envelopes. I made a bunch of these cards to create gift set, so naturally I needed a little box to hold them. 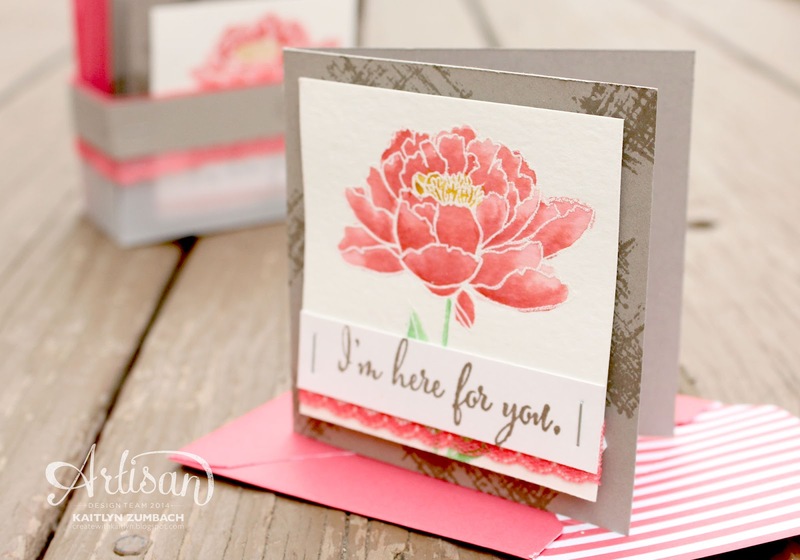 The vellum is perfect because it compliments the softness of the cards and doesn't take away from them. 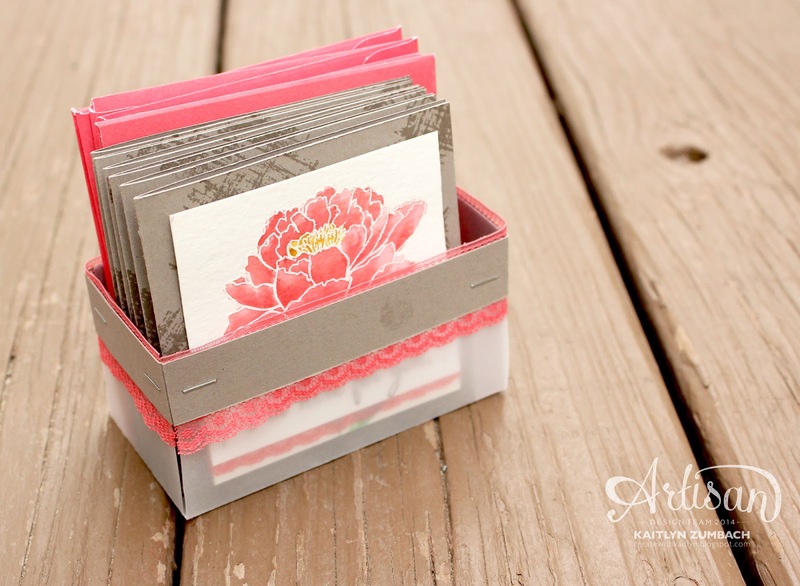 The box is decorated with just a bit of Tip Top Taupe Card Stock and some more of that pretty Watermelon Wonder Lace Ribbon. So do you have a mile long wish list already? Keep on following the hop to discover more amazing projects! Don't tell anyone but these are my FAVE! 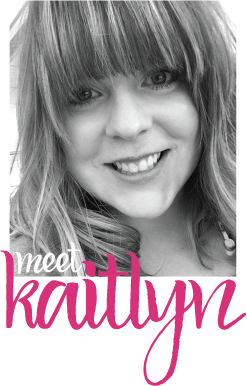 You did a phenomenal job on these Kaitlyn! Quelle délicatesse dans ce projet Kaitlyn ! beautiful card! you mentioned using gumball green.....?!? Beautiful - I might have to put his set on my wish list! I love the lace like that! This is so pretty and what a great boxed set! These are lovely and a box and envelopes too! To die for! Wow, that flower looks prettier than I had originally thought now that I've seen it water colored, very nicely done. Tip Top Taupe was my fav from the get go but I love the way you have paired it with the WW! Nice job! Gorgeous little set of cards, Kaitlyn & I love the adorable box too. The new colours look so great together how you've combined them. Thanks for sharing them. fabulous...love the little staples and lace on the box! thanks for the inspiration! What size are the cards and envelopes? What did you use to create the envelopes? Hi Elaine. The cards are 3-1/2" x 3-1/2". I used the Envelope Punch Board to make the envelopes. The envelopes started as a 6" x 6" piece of paper so that you can get four out of one sheet of Envelope Paper. If you have any other questions please ask!